Deinonychus was discovered in 1964 in Montana, and was described by John Ostrom. 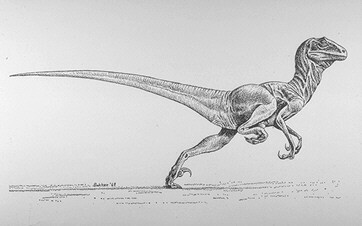 It was a larger version of Velociraptor and was certainly capable of running and leaping. It was interpreted by Robert Bakker. amongst others, as a warm blooded, agile, intelligent and very swift creature. Restoration by R. Bakker for John Ostrom 1969. Ostrom and Bakker went on to propose new ideas about dinosaurs, including the theory that they may have been fast moving warm-blooded creatures - like birds - rather than the slow ponderous cold-blooded creatures - like lizards - that we generally envisage.